Here at Stonecreek lighting, innovation will include greater options to singularize existing and or new low voltage organic luminary designs to complement not only existing line wiring but also new low voltage networks built into hybrid green architectural styles. New Green Architectural styles will include greater day light luminance designed into structures combined with the direct influences of daylight harvesting controls included with low voltage design luminaries. Using Natural or recycled materials in design of luminaries combined with efficiency and economy, secondary low voltage Stonecreek lighting systems will continue to dominate the growth in sustainability. In addition to example of wall sconce above, many pendent, and chandelier styles are also available by design. Features available would include many custom back illuminated or “lumina art” designs, with many lens options. 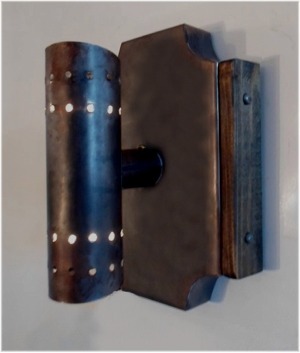 Typical Sconce as rendered above is intended for hallway wall wash egress illumination and would include a 12V internal step down transformer for use on any existing 120V line connection. Internal MR11-LED would consume only 1.5 Watts of power, and is comparable to a 15W Halogen though only consuming 150 mA of current. Bulb coloration is available in warm 3000 Kelvin white, and life is 50,000hrs.